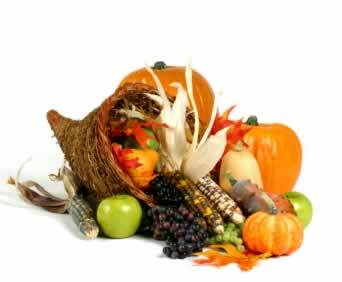 The celebration of Thanksgiving is a celebration of the early American colonists survival in a new and dangerous land. Each year we celebrate not only their triumphs, but also give thanks for our own. They brought precious seeds, herbs, and medicinal plants with them on the perilous sea voyage. 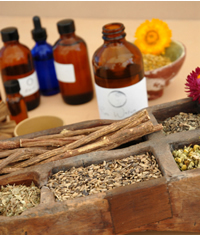 Early American settlers learned the uses of local plants and herbs from Native Americans and this combined herbal lore carried them through those first dark years and formed the basis of uniquely American herbal traditions. The colonial garden provided food for the larder, dyes to brighten for homespun clothes, savory herbs for the pot, and medicinal plants that served in good stead in a time where doctors were scarce and pharmacies non-existent. The garden also provided a bright solace for the soul in an otherwise hard existence;flowers and herbs were grown not just for utility but for their beauty as well. As the leaves turn and mornings begin with frost we celebrate the harvest with feasting and family. Savory herbs such as parsley , sage, rosemary and thyme are the culinary stars of the Thanksgiving celebration. The recent Halloween jack-o-lantern pumpkin now provides the makings of creamy pies and custards. The kitchen is redolent with the heady aroma of spices - cinnamon, nutmeg, ginger, and clove studded oranges. Walnuts and hazelnuts, rich in fats, minerals, and vitamins, still claim a high place in the holiday tradition even though modern life has dulled the memory of how they helped our ancestors survive the deprivations of winter. Thanksgiving is as much about feeding the soul as the body. Enjoy.